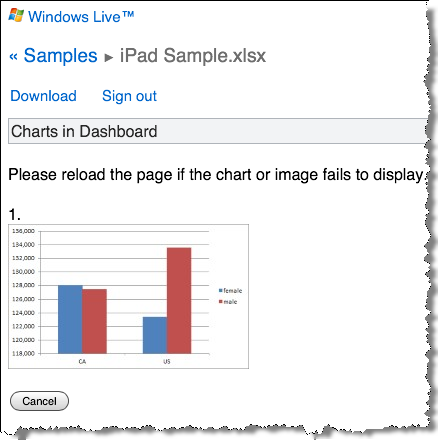 Excel on the iPad? For sure! 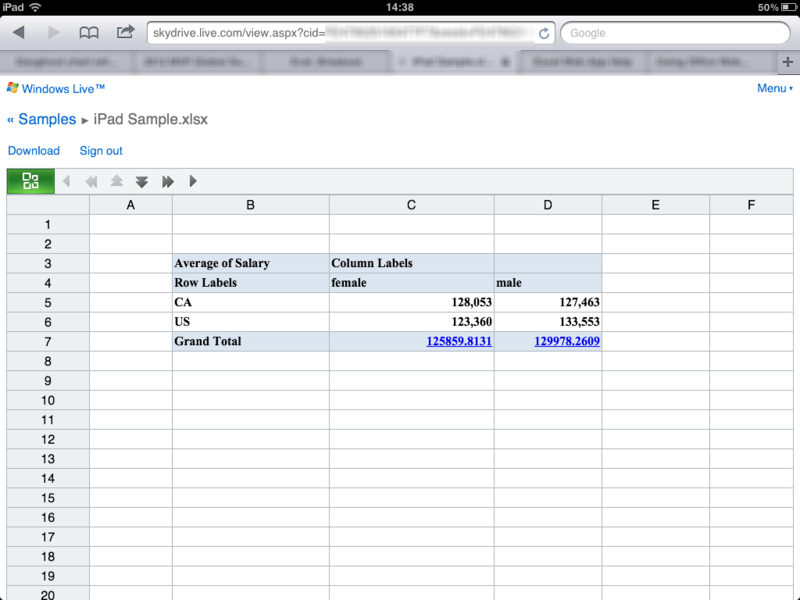 You can view and edit Excel files on your iPad easily — and you don’t need any special apps to do so. 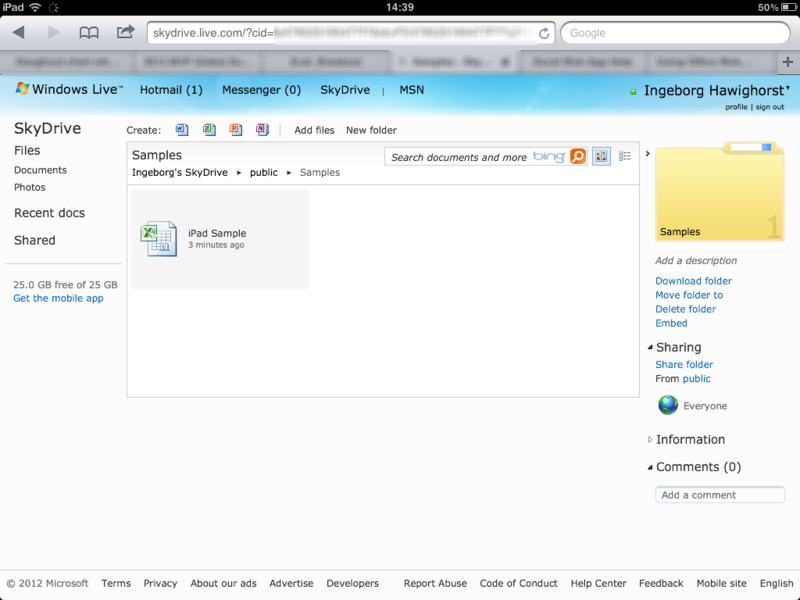 On your PC or Mac, point your browser to www.skydrive.com. 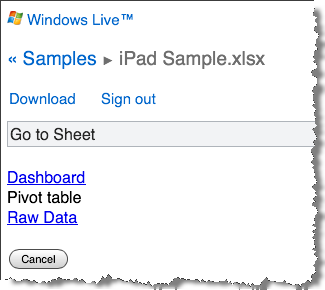 Sign in with your Windows LiveID in the dialog that appears on the right hand side of the screen, or, if you do not yet have a LiveID, sign up for one with the button in the left hand panel and follow the instructions. Microsoft gives you 25GB of SkyDrive storage space for free. Let that roll off your tongue again: twenty-five GigaByte of storage space – for free! In your SkyDrive space you can store all kinds of documents. You can create folders, you can share folders with everyone, or just selected people that you invite, or keep folders private. 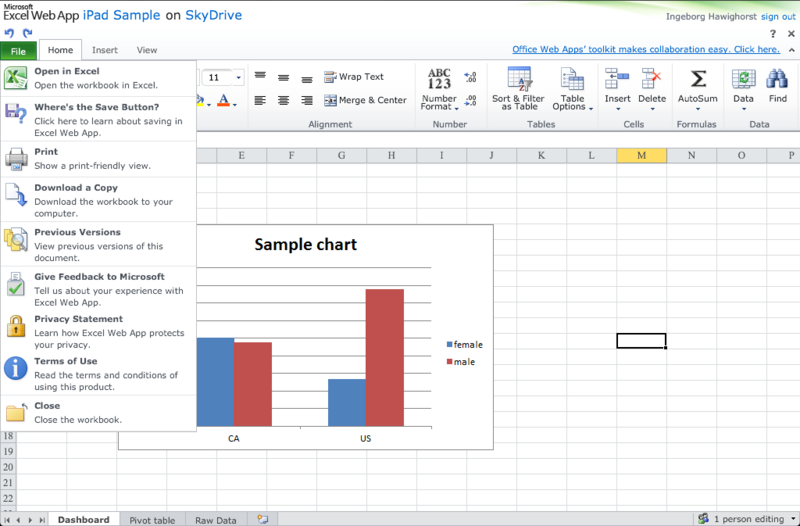 Learn more about SkyDrive in the SkyDrive Help Center. 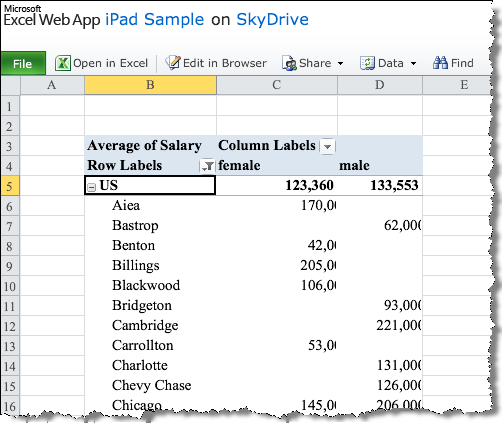 Now, for the purpose of this exercise, copy or move some of your Excel files to a SkyDrive folder. There are many ways to do this, for example via the “Add files” command in your SkyDrive home page. 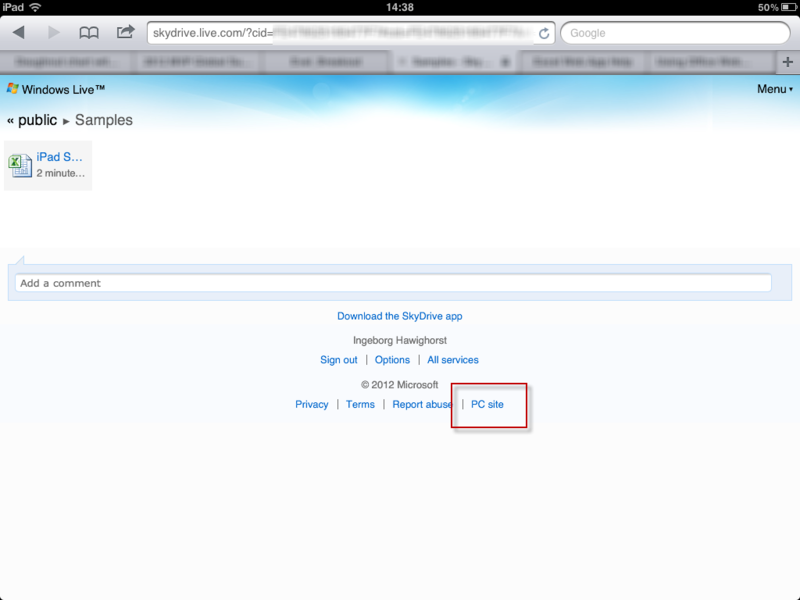 Once you have uploaded a file, you can click it and it will open for viewing in the browser. There is also a command to “Edit in Browser”. This makes the spreadsheet editable. The browser based editing is called “light editing”, and it includes many more features than most Excel users will ever need. 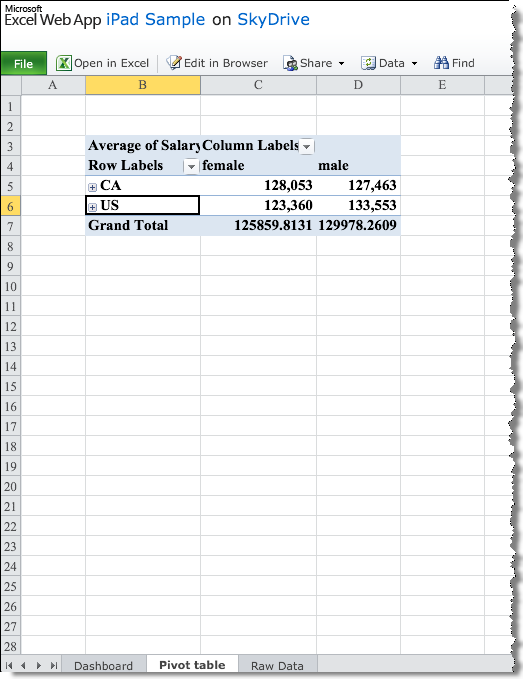 You can edit data, use formulas, insert charts, format cells, etc. All this works in your desktop browser, so of course, all this will also work in the iPad Safari browser, right? Yes, it will, but you may be a bit disappointed at first. Anyone impressed so far? Well, I wasn’t. Why can’t I see on the iPad what I can see on my desktop computer, i.e. an interface where I can see the sheet tabs, edit the file in the browser and all? To the right of the Bing search box, you can tap the icons for list view or icon view. 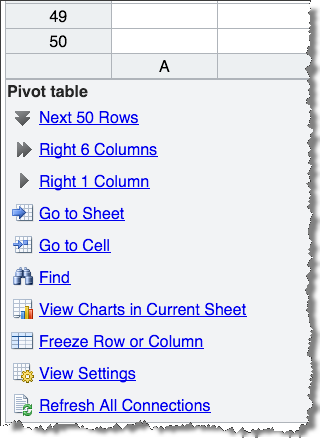 You can click on the + icons to expand the pivot table groups, you can use the pivot table filters, you can tap on the sheet tabs to change to the other sheets and view the data and the chart. If you tap the “Edit in browser” link, you will get the same interface as on your desktop machine: you can edit cells, use formulas, and even do things like adding a chart title to the chart. 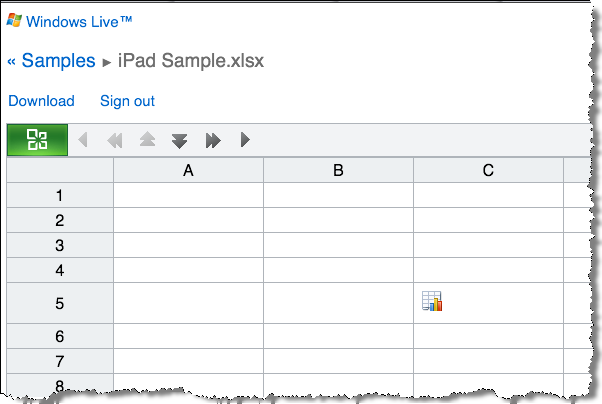 So, there you have it: create and edit Excel files with Excel on your iPad — for free. No apps required, no downloads required.